The Colombian state has responded to Buenaventura’s increased violence in recent years, which has lately caught international attention (read the Human Rights Watch report and a recent New York Times article) with an increase of police and military forces in the city. Despite their presence, violence in the street increased, according to the inhabitants of these vulnerable neighborhoods. One of the affected streets has been Puente Nayero, where a “chop-house” caused residents to live in terror. In chop-houses people were tortured and dismembered to death. In April last year, inhabitants and neighbors of Puente Nayero burnt down one of these chop-houses and transformed, with the help of the Inter-Church Justice and Peace Commission the street with its two adjacent wooden bridges and houses into a humanitarian space, a space free of illegal armed actors in one of the most violent cities of the world. 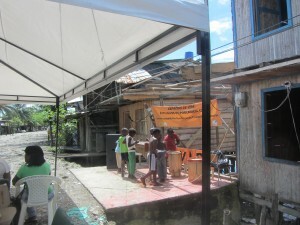 Several families, including the Aragón and Valenzuela families from the neighboring street, Punta Icaco, have supported Puente Nayero, the first urban humanitarian space inaugurated in 2014. The Aragón and Valenzuela families are also amongst those actively resisting cooptation, forced recruitment and the abuse of young women by illegal armed groups exerting social control. 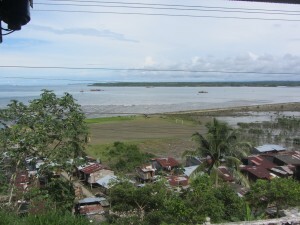 Several people from Punta Icaco have been killed in this struggle. In April 2014, the son of Yuri Marcela Jiménez, was dismembered and killed. One year ago, paramilitaries tried to recruit and finally killed Óscar, son of Maria Nieves Torres, one of the threatened leaders and human rights defenders from Punta Icaco. In April of this year, a salesman of Punta Icaco was killed, most likely because he refused to pay the “vacunas” (extortions that illegal armed groups force traders to pay). Punto Icaco is a trading hub where goods that come from the rivers surrounding the city of Buenaventura are unloaded. Over the last few years, the families Valenzuela and Aragón have been trying to create alternatives for local youth, a life based on non-violence, and self-determination. Soon afterwards the families started receiving threats from BACRIM groups (the post-demobilization criminal gangs named BACRIM for their acronym in Spanish or neo-paramilitaries), illegal armed groups fighting for control over the neighborhoods. Buenaventura is Colombia’s largest port city: 60% of all goods entering and exiting via the ocean go through this port). Yet 80.6% of the population lives in poverty with 47.32% in the region do not have their basic needs met. The population of the area (a man-made island that was made by paving over trash) has grown in the last seven years from 30,000 to 110,000 personas with more than 98% being Afrocolombians, forced out of their rural river communities by violence. The island is threatened by the port and tourism project “Bahia de la Cruz,” whose realization will displace the people who live there. An alarm of lively music starts each day around 6am, and the street slowly comes to life. Sweetened coffee percolates in houses, fishermen head out in their small wooden boats, and kids get shuffled off to school. Over the ocean, the houses on stilts become busy, and playing children fill the rocky dirt road and elevated walkways of wooden planks. As day turns to night, the doors and windows remain opened until late, the smell of food and sound of voices and music fill the air, and the news of the day is shared between small groups of neighbors and families gathered outside of their houses. It is a daily scene far removed from what it was just four months ago. Welcome to Puente Nayero, the first urban Humanitarian Space in Colombia. The petition to create the Humanitarian Space came from one of the community leaders of La Playita. After exploratory visits and exchanges with rural humanitarian zones in other regions of the country, he proposed the creation of an urban space free from the presence of all illegal armed actors. He made an official petition to the Comisión Intereclesial de Justicia y Paz (Inter-Ecclesiastic Commission of Justice and Peace), a Colombian human rights NGO, to help facilitate the establishment and accompaniment of the Space. The Commission accepted the petition, and in turn requested the presence of international accompaniers to help provide additional security and spread international visibility for the community. Prior to the creation of the Humanitarian Space on April 13th of this year, this road in La Playita was empty by 6pm every evening. One of Buenaventura’s most dangerous neighborhoods, residents were prisoners in their homes, afraid to be out in the street after dark. At the end of the road was a ‘chop house,’ where local paramilitary groups tortured and dismembered people, tossing their remains into the ocean. As a bold move toward empowerment, during the opening week of the Humanitarian Space the community made the decision to burn down the house. It is not a new violence in Buenaventura, but one that continues to be complicated by the presence and involvement of the region’s powerful actors: Colombian public forces, illegal paramilitary groups and drug-traffickers, multi-national corporations, and touristic mega-projects. Buenaventura contains Colombia’s largest port, and has been the country’s drug-trafficking hub for decades under the control of surrounding illegal armed groups.For as long, the city has also been a destination for families and communities forcibly displaced from throughout the Department of Valle de Cauca by these same powerful groups. As people fled to the city for safety, lack of space soon became an issue. In order to create more habitable space, communities constructed roads out of garbage, dirt, and rocks, allowing for new neighborhoods to reach out over the ocean waters like outstretched fingers. Now these same neighborhoods have become the new urban targets of 21st Century Colombia. Their coastal location has been identified as prime real estate for tourist development and mega-projects, such as hotels and boardwalks. Great efforts have been made to free up the valuable property, including threats and violence toward residents by paramilitary and criminal groups. Since the 2005 “demobilization” of Colombia´s paramilitary groups – considered largely unsuccessful by many national and international entities – smaller, but powerful factions have continuing operating throughout the department. Officially referred to as criminal or delinquent gangs by the State, said groups have had a heavy presence throughout Buenaventura’s urban neighborhoods and rural surroundings, using extortion, threats, violence, and murder as a means to control and displace the civilian population anew. Local officials have tried other large-scale tactics, such as the campaign they launched in February for tsunami emergency evacuations drills. Poor neighborhoods along the coastline were urged to permanently evacuate and relocate due to the high probability for tsunamis. Coincidentally, these are the same locations that have been earmarked for new hotels and a long, extensive boardwalk. As another way to relocate residents from neighborhoods on desired land, authorities have used the promise of an opportunity for better living conditions in newly constructed housing further inland called San Antonio. According to the Comisión Intereclesial de Justicia y Paz and residents, those who accept the offer find themselves in a completely isolated area without potable water, a health center, a school, or access to transportation. It isn´t until they attempt to return to their previous house that they realize they unknowingly signed it over to the state. With the port expansion, entry of more multinational corporations, and increase in large-scale tourist projects, violence and displacement in Buenaventura have continued at an alarming rate. Local and regional authorities, plagued by years of corruption, have yet to develop an effective or comprehensive strategy to address the urgent situation. As part of his bid for reelection, President Santos demonstrated his dedication to curbing the extreme violence in Buenaventura by calling for additional militarization of the city during the months leading up to the May elections. Despite the massive joint effort between the marines, coast guard, and national police, neighborhoods continue to be controlled and terrorized by violent groups who identify themselves as paramilitary factions, but whose existence the State refuses to acknowledge. These groups regularly announce their connections to and support by the local authorities, an accusation residents have been making for years. Local residents have reported that not only do the marines and national police ignore the movements of paramilitary and faction groups, but often clear out of areas just before violent acts are perpetrated against civilians. Labeled a humanitarian crisis by Human Rights Watch and featured in a report by Amnesty International earlier this year, Buenaventura and Puente Nayero have been gaining international attention. Even so, since the Humanitarian Space was established, more than fifty threats have been made toward community leaders and members, as well as toward the national and international accompaniers. It has remained a challenge to prevent illegal armed groups from moving through the Space, which can be easily accessed by water and neighboring streets. The community is also still waiting for a response from the State to its official request for the provision of additional security measures, including a request for protective measures made to the Inter-American Court of Human Rights. Despite all the obstacles they face, the members of Puente Nayero are continuing to organize and unite one another in their mission to maintain a space free of violence, and hope to serve as an example and inspiration for surrounding neighborhoods of the power of a non-violent social movement. To date, there have been no murders in the Humanitarian Space. At the end of Puente Nayero, the dirt road meets the ocean and a welcome breeze cools the hot air. Between two houses there stands an empty space where just four months ago the ‘chop house’ used to be. In the time since, the community has converted their grief into a space to commemorate and celebrate life. Life. 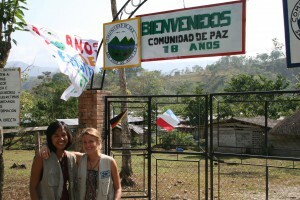 Welcome to the Humanitarian Space of Puente Nayero.